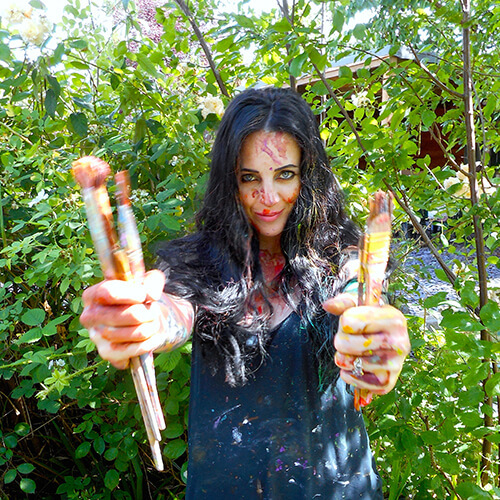 To offer AN EXPERIENCE – not just art classes! To celebrate positivity, uniqueness & individuality! To welcome children of all ages and abilities! To provide a unique opportunity for children to get truly creative & express themselves in a safe & friendly environment. To give children the time, space, guidance & resources to help them learn new skills & techniques, build their confidence, boost self esteem, have fun & make friends! To encourage children to try new things, use their initiative & imagination & provide all the materials to allow them to experiment & explore as much as they wish! Over the last 15 years, Parsley Pie Art Club has helped and guided countless children from all over the UK with their creative enjoyment! We run fun & relaxed classes, parties & workshops! 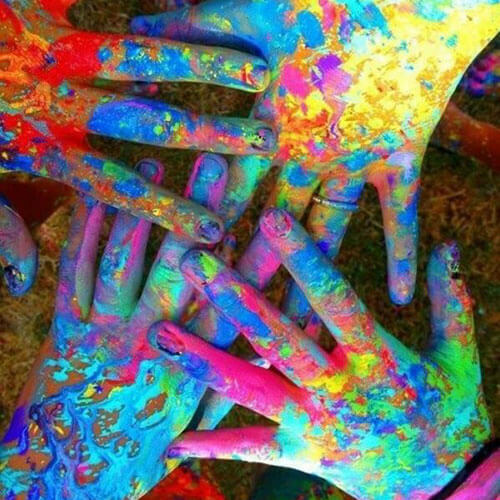 We celebrate diversity & mess! We aim to inspire with a friendly, open & positive approach! Children are free to make their own decisions and create what ever they want, while at the same time they are learning, achieving & making progress! This helps children to feel confident, happy & proud! They also interact with other children of different ages & from different cultures at Parsley Pie, sharing ideas, experiences and enjoying the class together! We believe all children are different! There is no pressure at Parsley Pie, children work on their own projects, in their own way, in their own space, in their own time! 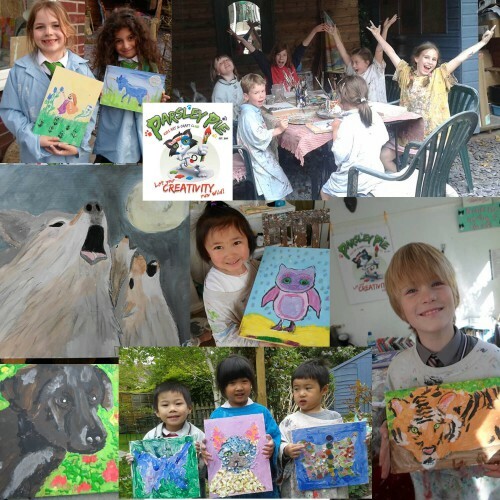 Parsley Pie Art Club thrives on an ethos of freedom of choice & freedom of expression! We encourage children to use their initiative & make their own decisions. Children are allowed to choose their own projects & themes, their own activities, materials, tools & equipment. This shows children how to be responsible for their own choices & actions, helping them understand the importance & the benefits of self responsibility, self discipline and patience! Children have to be well behaved at Parsley Pie Art Club! Self aware & self disciplined & responsible for their own actions! In return for good behaviour, polite manners, showing respect & patience, children are rewarded by having total freedom to choose their own themes, materials & activities! Parsley Pie Art Club strives to encourage freedom of expression. It produces brilliant results when children work on things they are passionate about & create things they are interested in! It helps the creative process & their focus & determination to do a good job, if children can relate to & are excited about the subject they are working on. They absorb more & learn more with out realising it, using their imaginations & initiative more effectively because they are happy, motivated & relaxed! Parsley Pie art Club provides a large “library” of books, photographs & pictures that the children can look at for inspiration! Plus we have the resources of the internet too! Parsley Pie Art Club provides a huge choice of materials, activities & tools. Children can experiment & explore ideas, discover new ways of working, while learning & having lots of fun! There are many activities/materials the children can choose from including ~ painting, decoupage, mask making, clay modelling, fabric painting, decorative mirrors, greetings cards, collage, paper chains, face painting, mosaic, drawing, glass painting & lots more! Plus, Parsley Pie Art Club introduces children to the endless supply of themes available, EG: ghosts & ghouls, princesses, TV & films, countries & places, dragons & monsters, dancers, super speed machines, fairies, sport, animals & nature, music & pop stars, cartoon & TV characters, mythical creatures, people, mermaid’s, tribal warriors, fashion, castles, pirates, festivals, mini beasts, historical people & places, imaginary creatures, outer space, sea creatures, super heroes, cartoon characters, vampires, aliens, elves, dinosaurs, buildings……….! We believe that some of the most important artistic traits to have are inspiration, passion, imagination and motivation! Plus there are plenty of creative skills & techniques that can be taught & nurtured: painting & brush techniques, colour mixing, using different types of paint, working with different materials, clay techniques and drawing skills & more, these can all open up a vast realm of creative possibilities and improve a child’s skills. 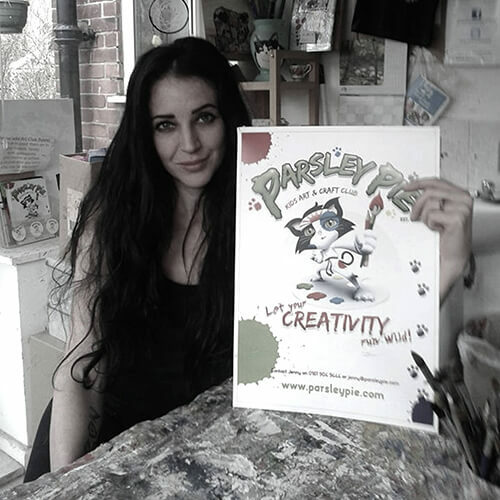 At Parsley Pie Art Club, we can demonstrate particular skills which enable individual children to reach their creative goals & full potential. 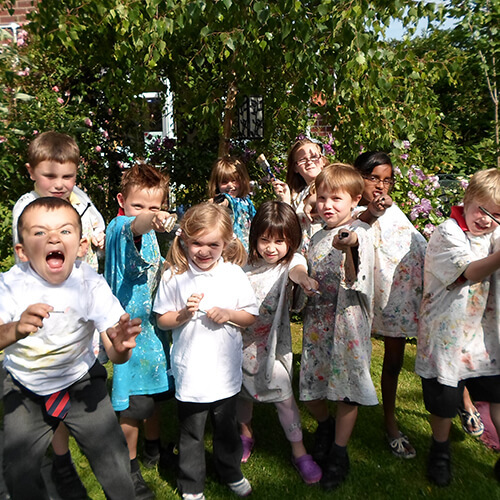 The environment we provide helps children to develop within themselves & their social skills too! This helps them to feel more passionate, inspired, motivated & be more open to learning. 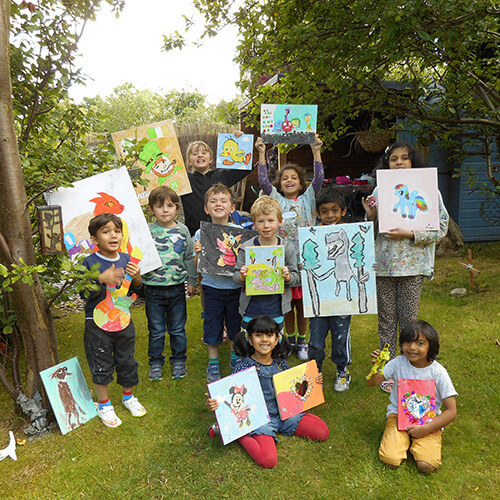 Parsley Pie Art Club helps children with self discovery, what they do & don’t like, what there their own limits & goals are. All these things help children to be truly happy & helps their confidence grow & grow! Children who feel that they can achieve their own goals & see their ideas through to the end, will feel that very precious sense of pride, they will grow to have more confidence within themselves. When children experience the process of making their own decisions & that this process can lead to successful results & a finish product they are happy with, this is an excellent way to build a child’s confidence & self esteem. Parsley Pie is proud to provide small class sizes! A maximum of only 10 children per group! This means that our teachers & mentors are able to give plenty of help to each child & demonstrate many different techniques! Each child is encouraged to use their imagination & initiative. Children are treated as individuals! We believe in the power of independent thinking! Parsley Pie offers a fine balance of structure & leaving the child to their own devices; which can only be done successfully with the many years of experience and training that our teachers have, working with children in this way! We advise & guide individually, giving each child what they need, but without spoon feeding them or letting them totally run riot! A relaxed, positive, safe & friendly environment! We believe that positive actions & behaviour get the best results from everybody! Being clear & firm, friendly & fair gets the best response from children! We also strive to teach the children life skills, including the “Art Of Patience”!